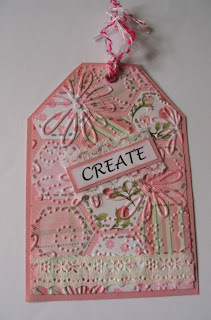 This trifold tag was made for the #NJJM Crazy 8 swap - we were given a number of prompts to and I managed to include them all. Lace - is used to tie the tag. Butterfly - there are some on one of the papers and I added a sticker to one of the tuck spots. Purple - there are some purple touches to some of the cupcakes. Glitter or foil - I used glitter card for the diecut on the front and as part of one of the smaller tags. Washi tape - used to adhere the journalling section. Ink/paint/marker - I've edged with Distress Ink. Book paper - covering the back. Eyelet/brad - on each of the main tags. The images came from a couple of old birthday cards, I was inspired by Melodi Huey's live video where she was going through some old cards and I just got some out and found exactly what I wanted straight away. Thank you Melodi! If you don't know the Newbie Junk Journal Makers FaceBook group, please do go and check it out, it's a fun place to hang out and make new friends. 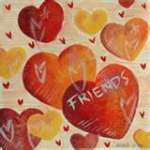 If you like making ATCs (Artist Trading Cards) you'll love the new Artist Trading Coins! 2 1/2" circles instead of 2 1/2" x 3 1/2" rectangles but the principle is the same. They're great for trying out new techniques too! These are my first Coins, made for a RAK Challenge on the NJJM Facebook recently. The theme was "freestyle" but as I was making mine at the end of October I used a free cover stamp from Craft Stamper magazine and went with a Dia de los Muertos theme. I printed off a distressed purple damask pattern background paper, die cut it into coins, added a glitter glue spider's web, some book paper and a strip of script washi tape. 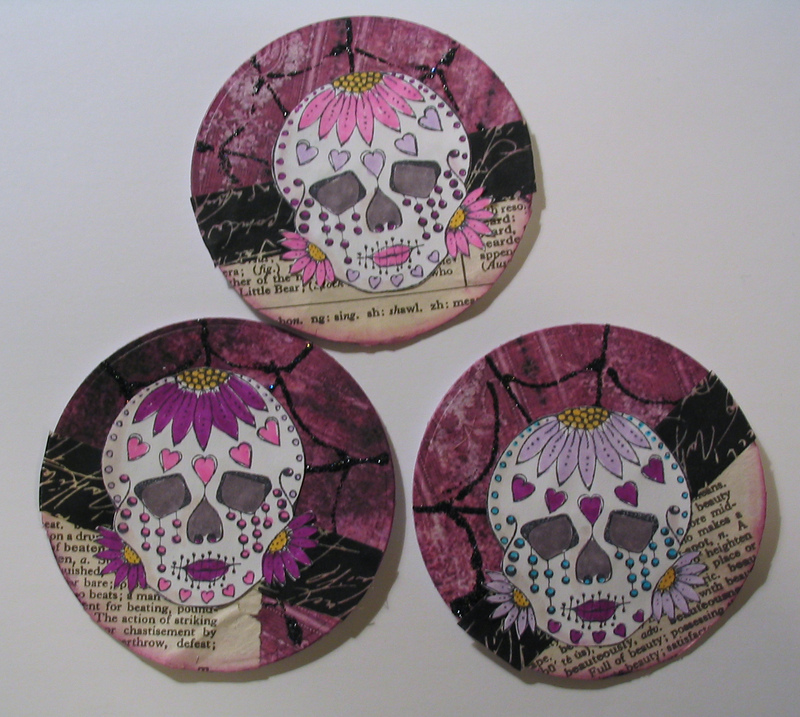 Then I stamped and coloured my skulls, fussy cut them and popped them on the top. They are now winging their way to Australia, but I made myself an extra one so I can keep one myself, as I realised that I hardly have any of my own makes as they are mostly swaps and presents. 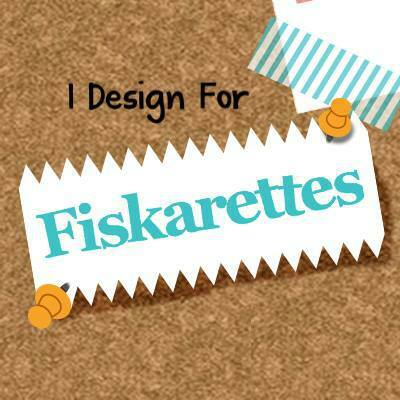 The Newbie Junk Journal Makers Facebook group ran a challenge this week to make a snippet roll. Yes I had to look it up too! It's basically a long strip of fabric, embellished with lace, buttons, beads, ribbons - anything you like really. I've never made one before, but seeing the pretty little rolls the ladies on the group were posting I felt I really had to have a go for myself. I discovered it's also a brilliant way to use up some of those little odds and ends that accumulate on a craft table! I cut a strip of fabric from a sleeve of an old blouse, dug out the sewing machine and just started adding lace and odds and ends of ribbon until it was covered. I then added beading samples I'd worked up years ago, a couple of keys, a brass filigree embellishment and some buttons and beads from my bit box. The pages of the needle case were made from two circles of white felt, hand stitched to the larger green circle. The stitches on the outside were hidden by the white and pink circles when assembled. The outside was formed of three circles of felt, cut with concentric circle dies on my Big Shot Plus. I sewed black beads onto the pink circle to represent the melon seeds, then stitched the three circles together with running stitch and edged the green felt circle with blanket stitch. I just caught the green felt with the running stitches rather than going all the way through so they would be invisible on the inside. I attached a button and a loop of ribbon to fasten the case closed and sent it off on its way for the swap. The Newbie Junk Journal Makers Facebook group are running a tag swap for World Mental Health Day. We had to make two tags with a positive mental health aspect (affirmations, quotes etc.) and swend to our swap partner. I blended several colours of Distress Oxides to make a blue sky effect. For the first, I stamped a sentiment that I am very fond of, and added a book paper cloud with some tiny sequins as raindrops, a die cut sun and rainbow (coloured with Promarkers) and a tiny wooden bird. 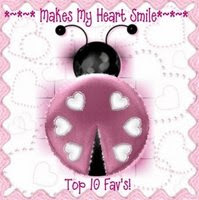 For the second, I added a stamped and coloured image, some positive affirmations and a wooden butterfly. 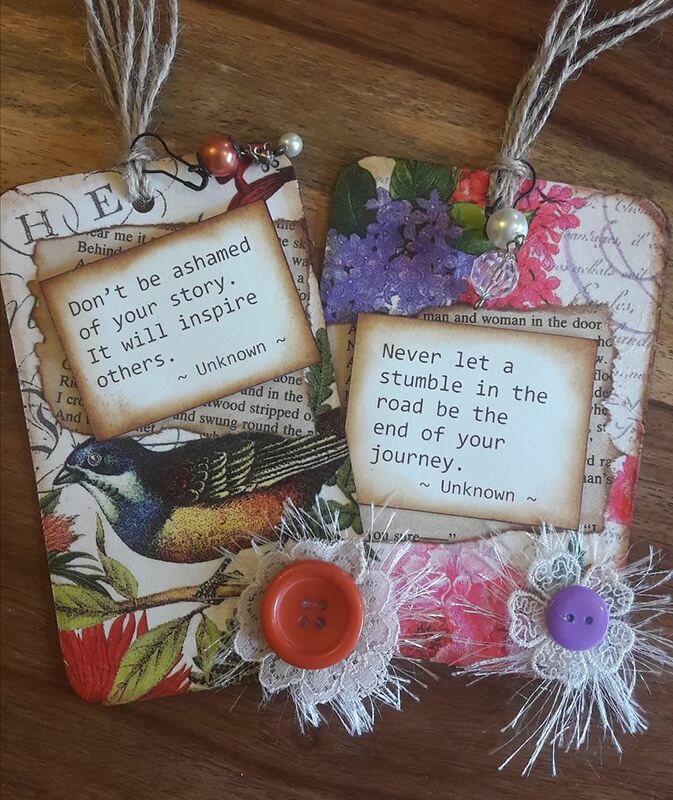 These are the wonderful tags I was lucky enough to receive in return from my swap partner Kelly: simply stunning! Another recent tag, also for the Newbie Junk Journal Makers Facebook group (NJJM) was for a challenge - the tag had to be an interpretation of a quilt block. There were some wonderful entries, some were actually quilted in fabric, but I chose to use my favourite hexagon quilt patch in coordinating papers. I stuck them onto a card backing and drew "stitches" with a pen, then used an embossing folder to add texture and highlighted it with a faint application of distress ink. 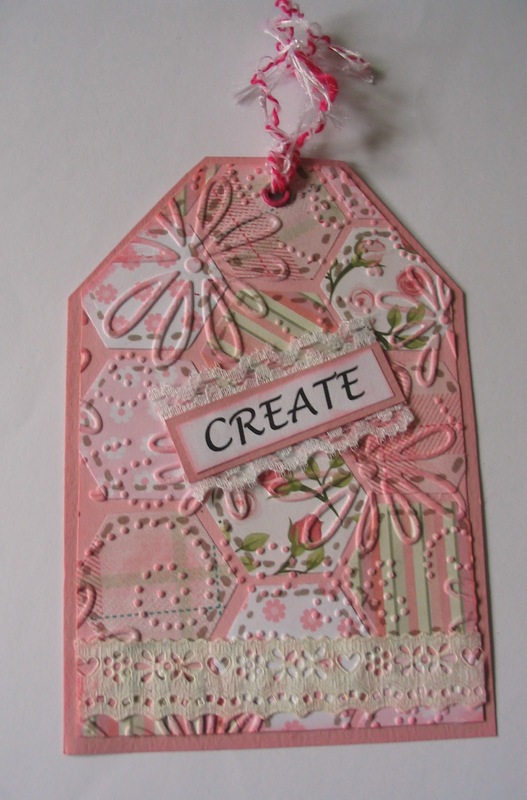 I then glued it to a slightly larger tag and added paper lace and a sentiment and then finished it off with an eyelet (I love my new Crop-o-dile!) and some fibres. 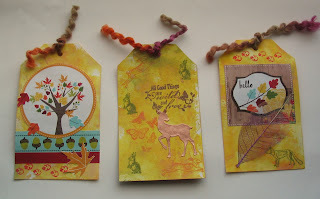 I have recently joined in a tag challenge on the Newbie Junk Journal Makers group on Facebook. I designed three Woodland themed tags: I'd decided that was going to be the theme of my next journal and making these was a good way of getting started on sorting out the papers and stamps that I would be using on it. 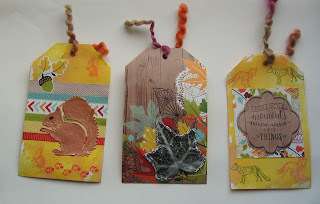 The tags all use up scraps from my stash of offcuts and magazine freebies, on a base of blended Distress Oxides stamped with some cute little wildlife stamps. I've used a die-cut stag on one, and a skeleton leaf on another. The yarn is variegated in lovely soft autumn colours, with a super crimped texture, again it came free with a magazine and I will be sorry to see the end of it as it is so unusual.